Name a dozen or more quality rock guitarists…. Ritchie Blackmore, Michael Schenker, Yngwie Malmsteen, Chris Impelliteri, Steve Vai, Taz Taylor, Ray Fenwick, Micky Moody, Jan Akkerman, Mario Parga, Slash, Bob Kulick, Danny Johnson, Viv Campbell, Dario Mollo, Axel Rudi Pell, Uli Jon Roth, Gary Moore. Now name us one singer who has worked with them all…. 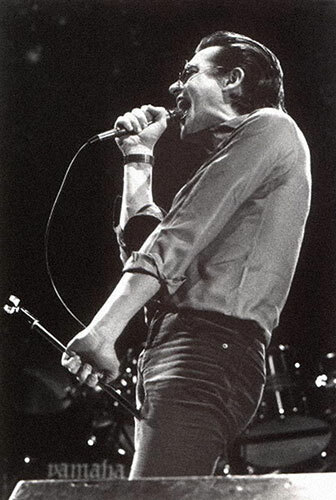 Graham Bonnet. For the first time the biography of one of rock’s most travelled vocalists is being published. Written by long time Bonnet fan (and one time publisher of Graham’s own fanzine) Steve Wright, and with the full co-operation of Graham himself, the book cover the singer’s long journey from bracing Skegness to the sunnier climes of Los Angeles, and all points in between. Including one or two of the more notorious moments of his career; but as Graham says, what’s the point in trying to gloss over events which are a matter of record. The occasional bit of over exposure aside, the book documents his career in fascinating detail, with input from many of the musicians, producers and people who have worked alongside him. You can read more and see page spreads on the site, and sign on for updates, pre-publication information and offers there as well. This entry was posted in Graham Bonnet and tagged biography, Graham Bonnet, The Story Behind The Shades by simon robinson. Bookmark the permalink.